That's right- time to get my littlest baby registered for Kindergarten. I can't believe it's that time already. 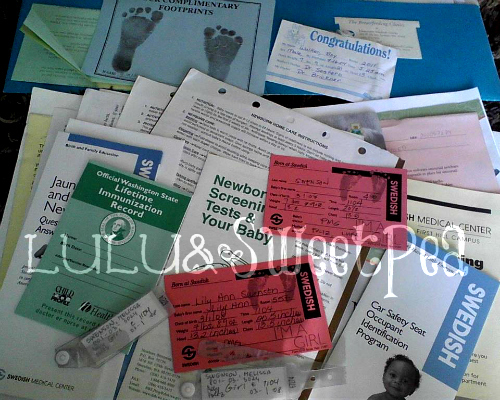 I was looking through my files and folders of important documents looking for her birth certificate and shot records and found both the kids' hospital paperwork. I guess I kept pretty much everything the hospital discharged me with, complete with their room service menu and a tiny sample of nursing cream. I got a little nostalgic looking at all of this stuff! Wish us luck! They told me to bring Lily with me because they like to do a little mini "screening" process to help place all of the children according to their needs. I'll have to update you all on how the whole process goes. I've been warned of some pretty crazy lines friend's have waited in trying to get the "good spots" for their kids in Kindergarten, but this school advises not to arrive early and that spaces aren't filled on a first come, first serve basis. Good to know, because I wouldn't want to have to defend myself against an angry soccer mom over something like a PM shift. Oh, the joys of school-age parenting! We registered my Lily last week for kindergarten, i actually held it together with no tears. August is going to be a different story, but i was surprised at how long the whole process took. Good luck! That sounds like a lot of work. We have parents just fill out the registration paperwork the day they come to register. Then they sign up for a screening time that's not until right before the school year begins! Kindergarten is such a great time! I had to register my child for kindergarten a couple of months ago. I'm terrified on the thought that she will be in kindergarten. It's going to be such a big adjustment. She will be going from a small classroom size(12 other kids) to a large class and 3 hours a day to 8. I'm not ready!!! Yeah I also agree that kindergarten is great time for every kid where they learn many things. Now Phoenix kindergarten is also ready to write a successful story of your kids.